I Love You More Than Carrots: Field Mom. It's Like a Stage Mom, But Outdoors. 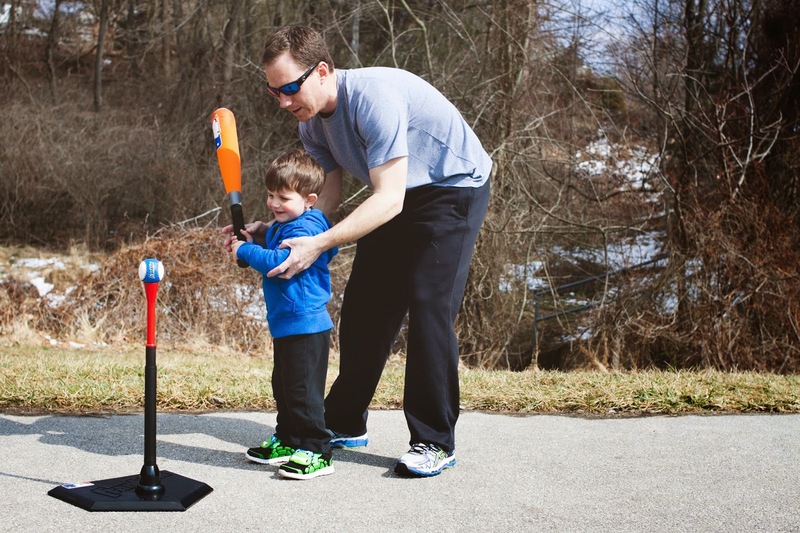 Last Spring we dipped our toes into the world of recreational kiddie sports. Or, rather, I should say that my husband dipped his toes into the world of recreational kiddie sports, more specifically, tot-soccer. 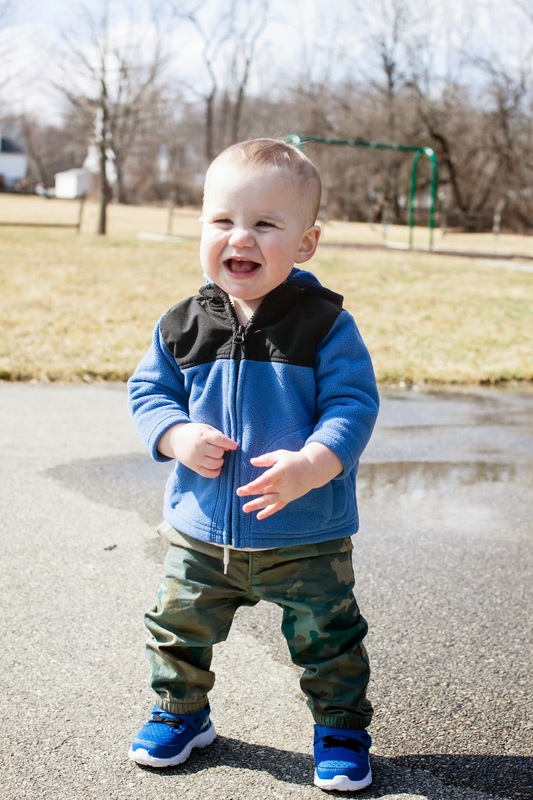 When tot-soccer began, I was grotesquely pregnant and not necessarily in a position to sit on a lawn chair on the sidelines, nor was I able to take on the responsibility of chasing our then-two-year-old all over God's creation while his brother, at 4, played some semblance of an organized sport. After every game, if you could even call them that, I would laugh comfortably from my seat on the couch as my husband would tell me stories of passionate sideline parents, tiny discombobulated players and games that seemed to play on forever. 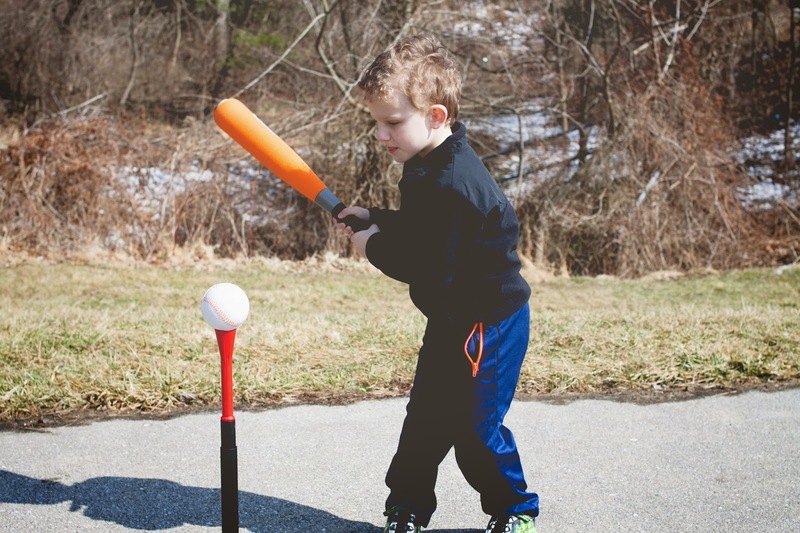 While Carter loved playing soccer last year, this year he wanted to try something different and that's when we took the liberty of signing him up for t-ball. 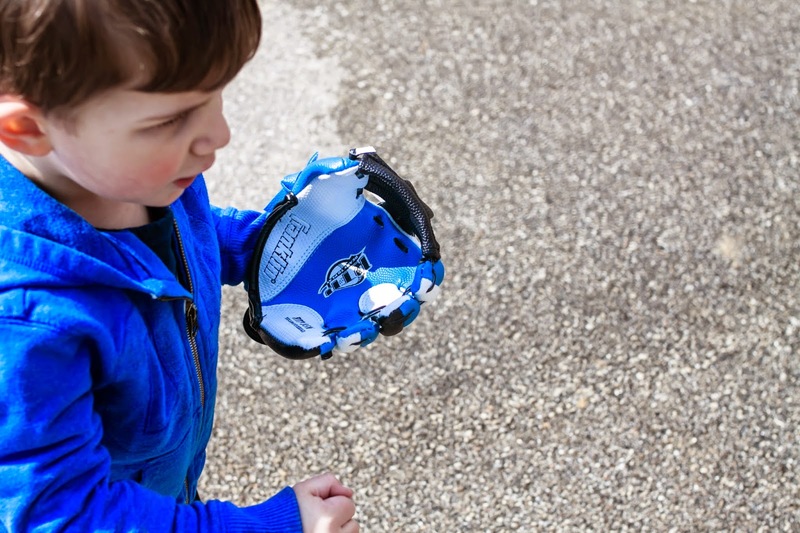 As a parent I feel like there are so many milestones to get excited about but seeing my baby pick up a glove and talk about his "baseball mitten" is one of the most exciting yet. I guess you could say I'm the boy-mom equivalent to a Stage Mom. As in, it's totally acceptable to show up to his first ball practice wearing a t-shirt with his name on the back, right? And maybe a giant button with his face on it as well? 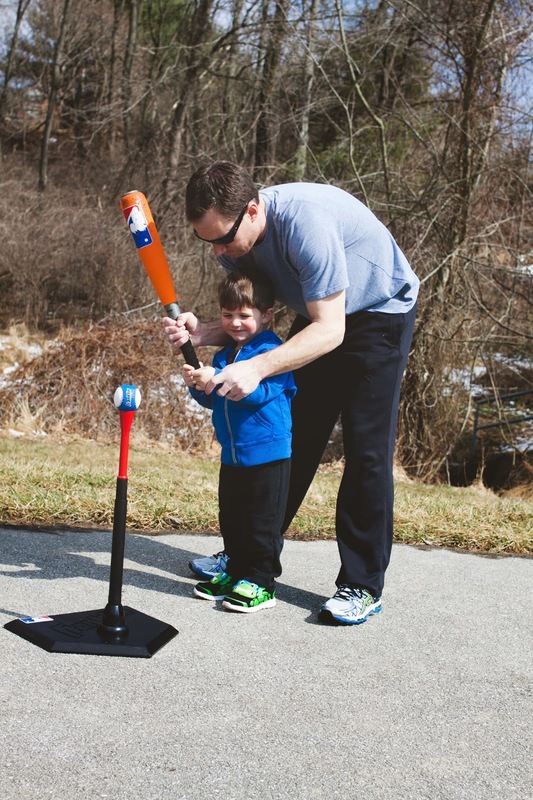 Shortly after we got the email informing us that he's been assigned to the team "The Bats," (it's still unclear whether we're talking about the flying kind or the piece of baseball equipment), we ventured out to pick up the necessary items we would need to get him started. 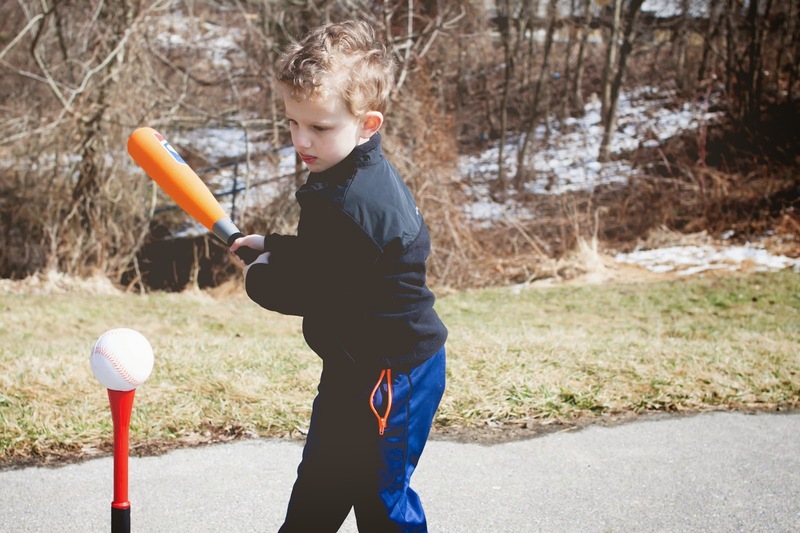 A variety of t-balls, a baseball tee, a helmet with a face mask, athletic shoes, two bats (one of the foam variety appropriate for a two and a half year old little brother) and two "baseball mittens" later, we were ready to hit the field. And by field I meant neighborhood basketball court. In my former life, I played softball for seven years. I started off as the right fielder picking daisies (literally) on my town's rec team "The Blue Bison," and ended my career as the starting pitcher for my high school's freshman softball team. Baseball is in my blood and as my boys get older, it's already evident that there's things they love that I'm absolutely clueless about. The distance that separates us in that sense will only get larger- so for now? We bond over baseball. Mittens included. 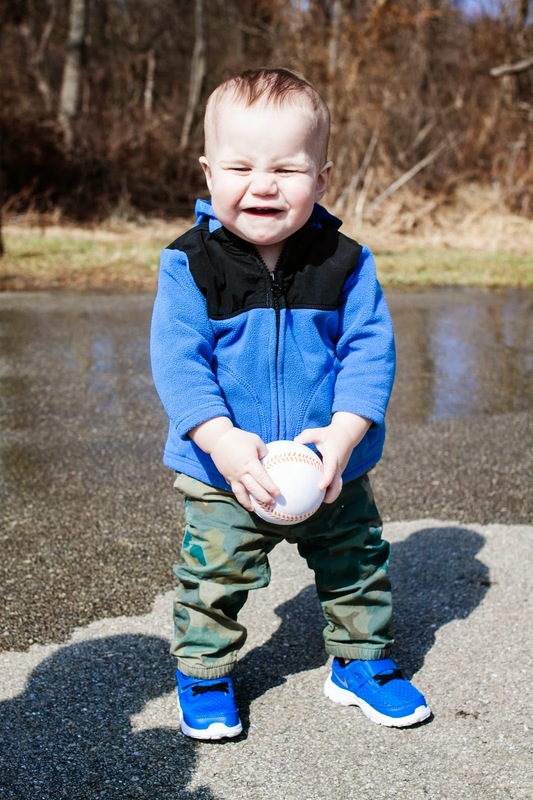 (If anyone tries to tell my two and a half year that it's NOT a baseball mitten, I'll punch them in the face). On what can only be described as the quintessential second day of Spring (we're ignoring the melting snow in the background, a product of the real first day of Spring), we ventured out as a fit family of five to impart parental wisdom in the form of proper stance and fielding techniques. Perhaps we still have a little work to do. Although it has already been decided that I'm totally going to be that passionate sideline parent. As evidenced by the look on my face during our very first "practice." If you ask the boys, their sudden athletic talent stems from their cool new kicks from Rack Room Shoes. 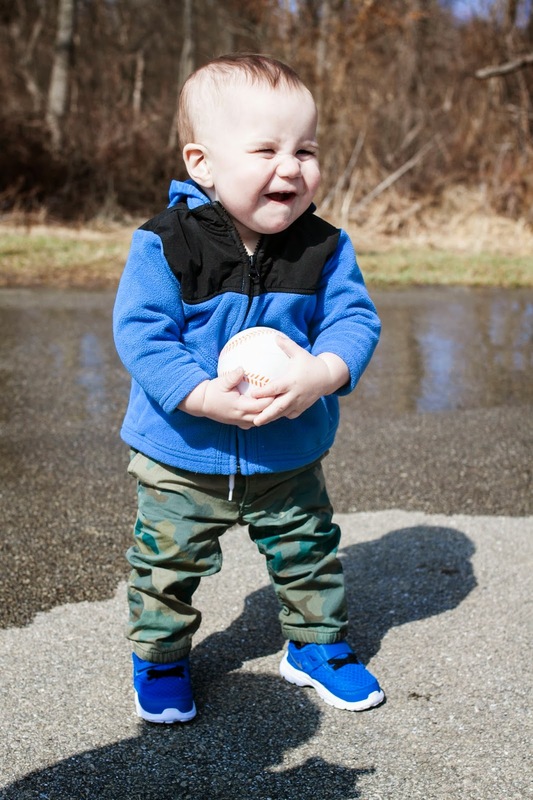 The minute my 2.5 year old slipped into his mega-awesome (his words, not mine) "Minja Ninja Turtle" sneakers, he was immediately transformed into a bad-guy-fighting, base-running, ball-catching machine. He also thought he could display his brand new ninja moves in the house which quickly bought those new sneakers a special place atop our refrigerator for a few days. Lesson learned. 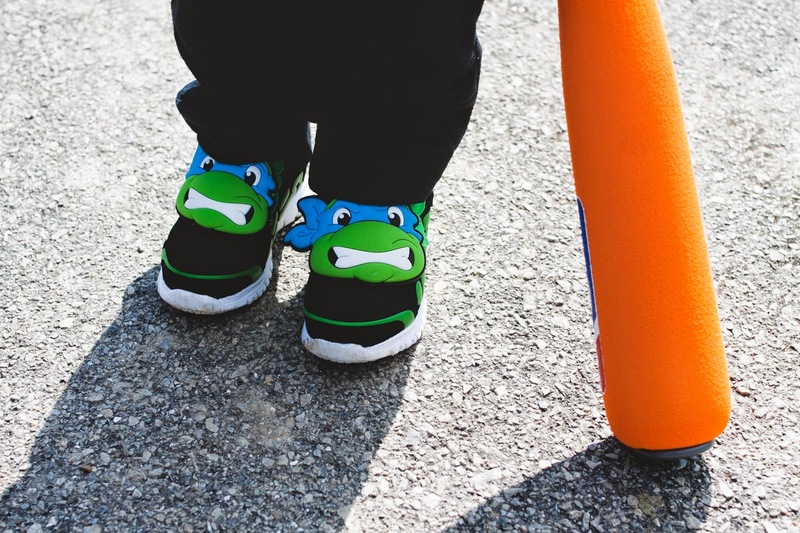 All the while, my 4.5 year old couldn't run the bases fast enough, showing off his super-amazing light up TMNT sneakers. Oh yes, I said light up. Cross that off the list of "things I swore my children would never wear." Lesson learned here? Never say never. 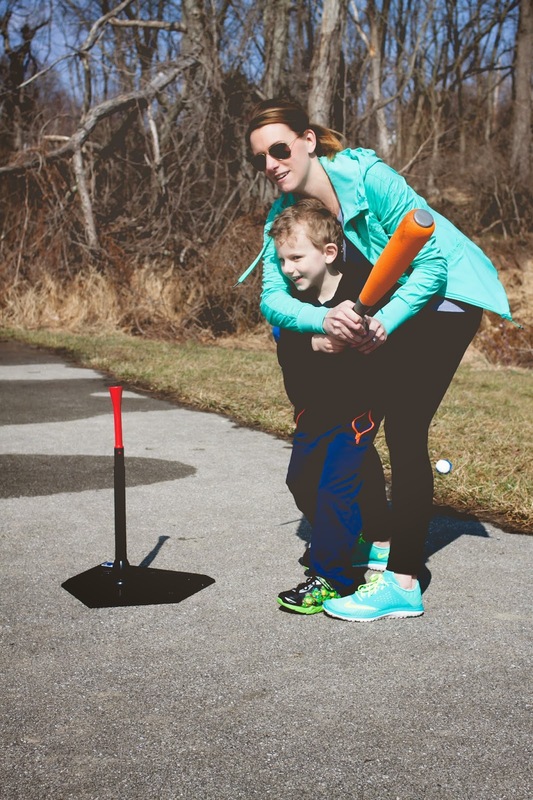 As for me and my husband, his sweet pair of Asics Runners (the only pair of athletic shoes he will wear) as well as my super-fun and awesomely-bright pair of Nike FS Lite Run sneakers, gave us just what we needed: the comfort and capability to run after our own mini t-ball team. 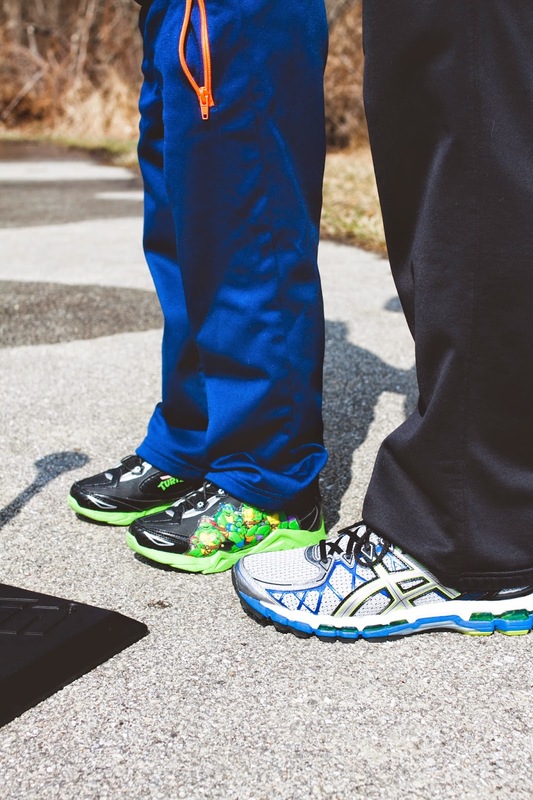 Whether we're hitting the pavement together for an evening run or chasing the boys around the yard, we can always count on Rack Room Shoes to offer comfortable, on-trend footwear for the entire family. After all, just because we're parents doesn't mean we have to sacrifice our sense of style! For a family of five (whaaaat, five!! ), footwear can get expensive. 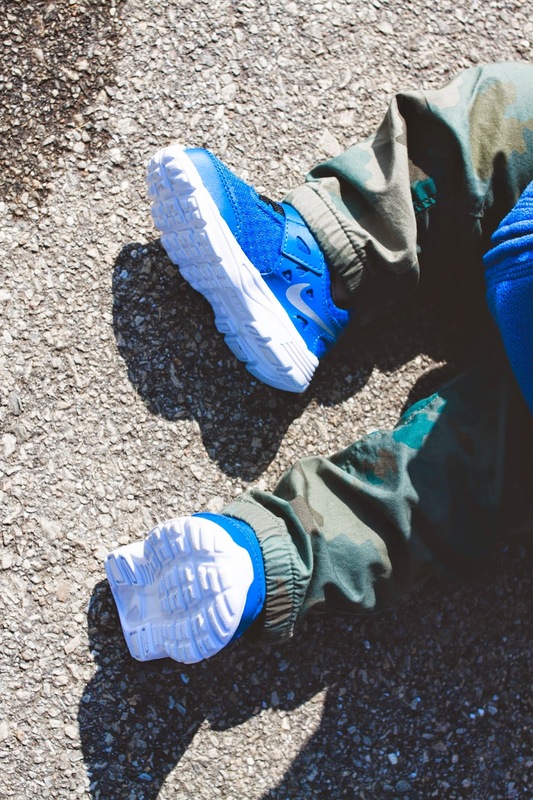 Rack Room Shoes is known for it's every day "Buy One Get One 50% off" promotion on all styles which makes the process of buying sneakers for everyone just a little bit less painful. Not to mention the Rack Room Rewards program that allows customers simple, instant savings on shoes for the whole family. Even the littlest member of our family threw on a fresh pair of infant Nike athletic shoes to join in on the family fun. With three boys in the house, I know that there will be many, many years of t-ball, tot-soccer and maybe even a little lacrosse ahead of me. I can only hope that the novelty of seeing them take the field doesn't wear off as time goes on. 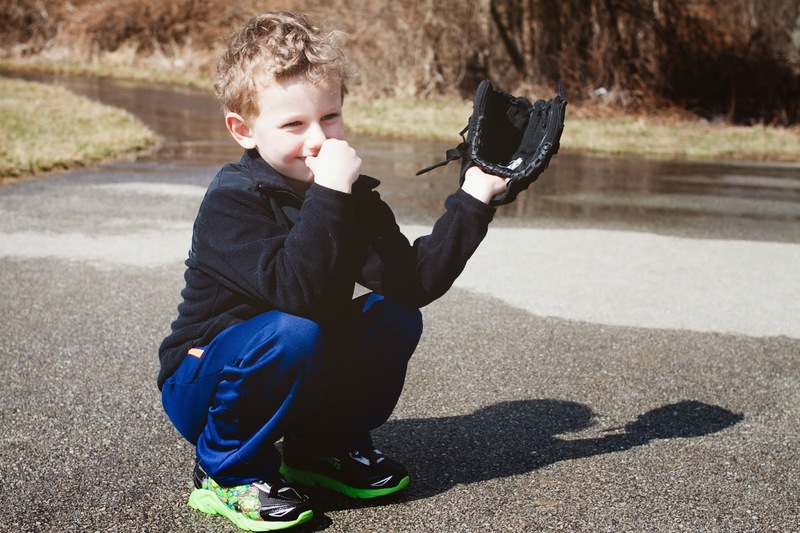 I also hope that my 2.5 year old always calls his baseball mitt his baseball mitten. That's not too much to ask, is it? This post is brought to you buy Rack Room Shoes. I received product for free in exchange for my honest opinion, as expressed above. Your boys are, as always, too adorable! I was not into organized sports growing up. But there is nothing better than watching my son play anything!!! And thanks for the idea- I am totally going to get buttons made!! !